It's Father's Day. You may want to do something extraordinary for your dad, like take him to lunch on the moon. (Warning: The restaurants there have no atmosphere.) You also probably want to make fun of his painfully awkward sense of humor. As it did last year, NPR is celebrating those corny jokes on social media. All it seems to take is one thunderously bad one and everyone wants to get in on sharing the cringe-inducing wordplay of fathers. 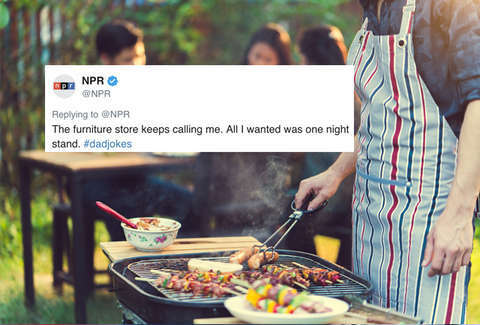 As NPR pointed out in their opening tweet, it seems no one is immune to the dad joke's allure. Even former President Barack Obama couldn't help dropping a dad joke from time to time. He unleashed a tidal wave of them during his final Thanksgiving turkey pardon, finishing his speech with, "I know there are some bad ones in here, but this is the last time I'm doing this. We're not leaving any room for leftovers." Here are some of the best worst dad jokes shared in honor of Father's Day. Because someone told him to get a long lil doggie. Me: hey son, guess who I saw yesterday. Me: everyone I looked at. One is a huge heavy animal the other is a little lighter. I've always had an irrational fear of speed bumps. My friend is a doctor, and when he got hurt, he insisted on stitching his own wound. Dad jokes may make you roll your eyes, but they're also one of the best parts about Father's Day. Otherwise, how would you know about the termite that went to a bar and asked, "Is the bar tender here?"